What’s up, gents? I’ve begun working on the next iteration and here’s what I’m up to. As everybody knows, the current database design in YOURLS is dumb and very inefficient. Its biggest flaw is that the keyword (ie short url) is repeated in both the URL and the LOG tables, making it absurdly difficult to update a short url without losing all historical data. Another design decision I regret was to store stuff in case they would be useful to anyone, such as user agents in the log table. Since there’s no core feature using that info and I probably won’t implement any, this should not be there. There’s a plugin API for this. There are a couple of awesome features I want to work on for YOURLS 1.6, one of them being the ability to store arbitrary data associated to any short URL — think url meta data, the way WordPress does it. The main URL table will be properly normalized with a URL id to stop repeating the keyword across tables. I could probably go further in normalization (storing the long URL and title somewhere else, as I first thought) but that’s where I think it becomes too much trouble and hassle for too few benefits. The URL_META table will store anything you’d like about a particular short URL and will be used by plugins: some tags, a note, a mime type to handle redirection differently, anything. The LOG table will be trimmed down a bit, which — disk wise — should be beneficial to sites with lots of hits, and properly. Again here I could probably go further and normalize the referrer information, but what bothers me then is the number of DB queries needed for each short URL redirection, which I want to keep at a very minimum. 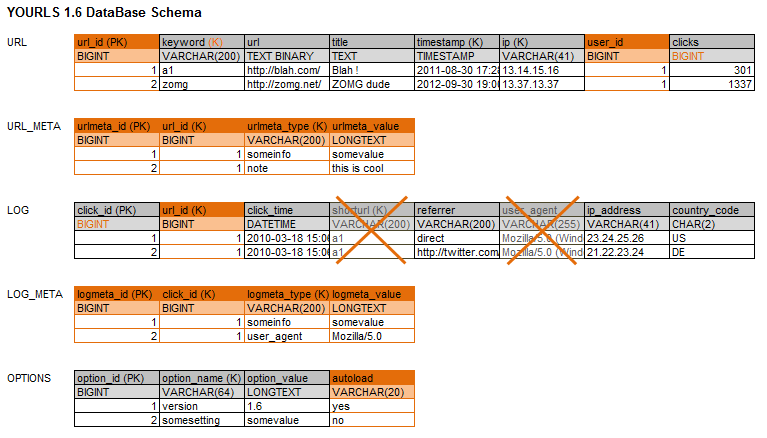 The LOG_META table, just as its meta sibling, will store anything you’ll want to store about a hit: the user agent, some cookie info, anything. No big change in the OPTIONS table, just an autoload parameter so plugins will be able to store anything without loading that every time in RAM. This entry was posted in Plans and tagged 1.6, DB by Ozh. Bookmark the permalink. Hi, OZH. I was recently watching for the requests for plugins, to see if I could create one or two, and itwas missing your URL_META table; it will be a great improvement. Steve: there’s no such problem. Read the doc and fix your config. Cool! As a first time user of Yourls, would you recommend I wait for 1.6, or is the release still a long way off. Also, is there a way to autogenerate a string that’s not sequential? 2. Plugin. Read the wiki documents on the project page. Thanks! I grabbed the nightly build. Found the plug-in, and I’m up-and-running. Much appreciated, it’s working splendidly! Will an upgrade script be provided to migrate from 1.5 to 1.6? I just updated 1.5.1 by overwriting with the newer 1.6 – it seems to work fine – but is there a better method (to protect the database etc) ? I’m using this for a book project to provide links for resources and further reading. A couple years ago I took a stab (with limited success) at modifying the code to allow >1 url/title per keyword. This allowed me to provide a single link like temp.url/key, which would take the user to a page that listed all the urls/titles associated with that key (e.g. more than one online resource for a given footnote). In any case, url_meta could work fine so long as url_id and url_metatype don’t have to be unique, but it would be a bit of a kludge to get a list of both urls and titles and retain the proper relationship and order between the two. Have you (or would you) consider separating keyword and url? I tried YOURLS mainly because of its awesomeness (reporting, UI, etc), but also because I couldn’t find another solution. Static pages kind of bug me, but I’ll take a look at that pages approach — that’s a clever idea. Thanks for your quick reply. Actually, with a url_id and no unique constraint on keyword, I could just dump multiple links for the same keyword into the url table. If there’s only one record returned for the keyword, then simply redirect, but if there’s >1 then show a list. This could allow easy editing through the UI, too — and no static pages. To clarify my need: Say you’re reading a book that makes reference to the Schmeling/Sharkey heavyweight fight in 1930. The footnote describes it briefly, and provides a single short link like sho.rt/ss. The reader types in that link and gets a list of resources: wikipedia entries for both Schmeling and Sharkey, the original newspaper report, and also a video of the fight from archive.org — all in one place. This seems like it would be a pretty handy feature. I’ve seen a few url shorteners that do just this. I know bit.ly allows you to create groups of links like this, so maybe check with them. If anyone else out there needs multi-URL shortening specifically, I’ve “bundled” a list of the first ten or so canned services that I found here: http://bit.ly/RPwXdg — I haven’t found any decent scripts yet, though. Bitly does exactly the same: there are shorturl, there are uniques, AND there is another thing, bundles. The idea of making shorturls non unique to either treat them as shorturls or bundles is completely clumsy. A bundle feature in YOURLS is totally possible with a plugin, either using the future urlmeta stuff, or already with the above suggested solution using pages. Hi, I’d store the ip address as ‘int’ rather than ‘varchar’ with the mysql’s built-in inet_aton function. Actually, your comment got me thinking. I don’t need to store an IP in the log table. I just need to store the associated country. In the URL table though, I need it. But I think inet_aton doesn’t work well with IPv6?